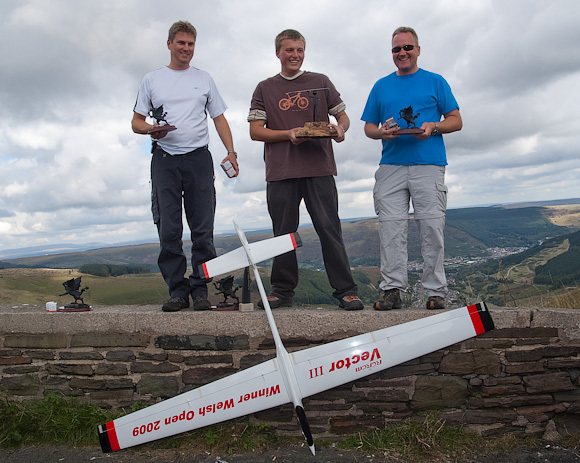 Podium lineup (L-R): Bjorn Tore Hagen (2nd), Graham Reed (winner), and Simon Thornton (3rd). Graham received the magnificent Vector III, kindly donated by RCRCM. Boasting some of the fastest F3F slopes in the UK, the Welsh Open is one of the highlights of the F3F calendar and attracts some of the best pilots from Europe and beyond. This year, fifty pilots entered from as far afield as Spain, France, Norway, Switzerland. The farthest travelled was C. M. Cheng from Hong Kong. The competition was generorously supported by SlopeRacer, RCRCM and SmartModel. Thanks guys! Good start, but could it last? Friday morning saw fifty pilots assembled on the north slope with their models. The competition got off to a cracking start with several sub-40's in the first round. In fact, some of us dared to believe that we might be in for a classic competition. Sadly it was not to be, as the wind deserted us on Saturday and Sunday, with zero rounds flown on both those days. Fortunately, thanks to the usual efficient organisation, five solid rounds were flown on the first day which is of course enough for a result, and those of us who were fortunate enough to have lightweight models enjoyed some excellent sport/thermal flying off the Wrecker. So it was that the Day One results stuck, with young Graham Reed ending up the winner. Thanks are due to Andrzej, Kevin and the rest of the SWSA for the usual efficient organisation. Also to Vic Eldridge for taking time away from home to organise the super banquet (I can see this becoming a fixture for future WO's). And of course to all the visitors from so many countries who made the event what it is. Finally to our sponsors SlopeRacer, RCRCM and SmartModel. There are two ways to view the photos. You can either click on the thumbnails below, or you can view a High-resolution slideshow. The following photos were all shot on the second and third days "after hours".